What is Apostolic Succession? It is the line of bishops stretching back to the apostles; it’s the uninterrupted transmission of spiritual authority from the Apostles through successive popes and bishops. In order that the full and living Gospel might always be preserved in the Church, each of the twelve apostles left a bishop as his successor. Thus all priests, ordained by bishops in the apostolic succession, are also part of the succession. For biblical corroboration look at Acts 1:21-26, where the apostles acted swiftly to replace the Judas’ position. After choosing Matthias they laid hands on him to confer apostolic authority. Also in 1 Timothy 4:14, where Paul reminds Timothy that the office of bishop had been conferred on him through the laying on of hands. The testimony of the early Church is deafening in its unanimous assertion of apostolic succession. Far from being discussed by only a few writers, the belief that the apostles handed on their authority to others was one of the most frequently and vociferously defended doctrines in the first centuries of Christianity. Behind all these questions lies the problem of the relationship between Scripture, Tradition, and the dogmatic pronouncements of the Church. The dominant note in our thinking is provided by the vision of the Church as willed by the Father, emerging from Christ’s Paschal mystery, animated by the Holy Spirit, and organically structured. We hope to set the specific and essential function of apostolic succession in the context of the whole Church, which confesses its apostolic Faith and bears witness to its Lord. This, then, is the methodological starting point of the document: any attempt to reconstitute the past by selecting isolated phrases from the New Testament Tradition and separating them from the way they were received in the living Tradition of the Church is contradictory. The theological approach that sees Scripture as an indivisible whole and that links it with the life and thought of the early community that acknowledges and "recognizes" it as Scripture certainly does not mean that properly historical judgments are eliminated in advance by an ecclesiological a priori, which would make impossible an interpretation in conformity with the demands of historical method. 2. This assimilation to the "thoughts" of Christ and above all to his sacrificial death for the world gives ultimate meaning to the lives of those who want to lead a Christian, spiritual, and apostolic life. That is why the early Church adapted the priestly vocabulary of the Old Testament to Christ, the Paschal Lamb of the New Covenant (1 Cor 5:7), and then to Christians whose lives are defined in relation to the Paschal mystery of Christ. Converted by the preaching of the Gospel, they are convinced that they are living out a holy and royal priesthood that is a spiritual transposition of the priesthood of the Old Testament (1 Pet 2:5-9; see Ex 19:6; Is 61:6) and that was made possible by the sacrificial offering of him who recapitulates in himself all the sacrifices of the Old Law and opens the way for the complete and eschatological sacrifice of the Church (see St. Augustine, De civitate Dei 10, 6). The documents of the New Testament show that in the early days of the Church and in the lifetime of the apostles there was diversity in the way communities were organized, but also that there was, in the period immediately following, a tendency to assert and strengthen the ministry of teaching and leadership. Those who directed communities in the lifetime of the apostles or after their death have different names in the New Testmanet. In comparison with the rest of the Church, the feature of the presbyteroi-episkopoi is their apostolic ministry of teaching and governing. 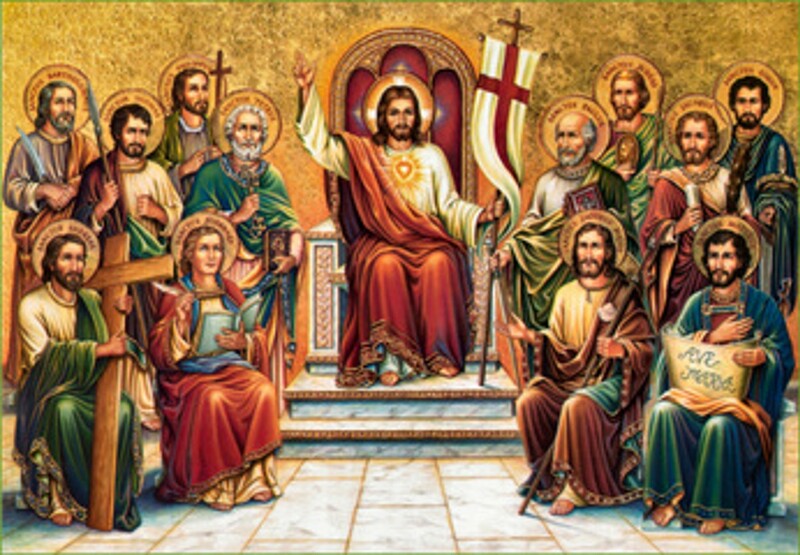 Whatever the method by which they are chosen, whether through the authority of the Twelve or Paul or some link with them, they share in the authority of the apostles who were instituted by Christ and who maintain for all time their unique character. The significance of the apostles at the time of the foundation of the earliest Christian communities was held to be essential for the structure of the Church and local communities in the thinking of the subapostolic period. The principle of the apostolicity of the Church elaborated in this reflection led to the recognition of the ministry of teaching and governing as an institution derived from Christ by and through the mediation of the apostles. The Church lived in the certain conviction that Jesus, before he left this world, sent the Twelve on a universal mission and promised that he would be with them at all times until the end of the world (Mt 28:18-20). The time of the Church, which is the time of this universal mission, is therefore contained within the presence of Christ, which is the same in the apostolic period and later and which takes the form of a single apostolic ministry. The absence of documents makes it difficult to say precisely how these transitions came about. By the end of the first century the situation was that the apostles or their closest helpers or eventually their successors directed the local colleges of episkopoi andpresbyteroi. By the beginning of the second century the figure of a single bishop who is the head of the communities appears very clearly in the letters of Saint Ignatius of Antioch, who further claims that this institution is established "unto the ends of the earth" (Ad Epk. 3, 2). Thus in the rule of Faith the immediacy of the divine Spirit in each individual is necessarily linked to the communitarian form of this Faith. Paul’s statement is still valid: "No one can say ‘Jesus is the Lord’ except in the Holy Spirit" (1 Cor 2:3)—without the conversion that the Spirit is always ready to grant to human hearts, no one can recognize Jesus as the Son of God, and only those who know him as the Son will know the one whom Jesus calls "Father" (see Jn 14:7; 8:19; and so on). Since, therefore, it is the Spirit who brings us knowledge of the Father through Jesus, Christian Faith is trinitarian: its pneumatic or spiritual formnecessarily implies the content that is realized sacramentally in baptism in the name of Father, Son, and Holy Spirit.